Remember this yummy looking dish? It's the pan roasted chicken I made during my recent blogger trip to Kroger, where the folks behind the ABOUND brand unveiled their brand-new line of dog and cat food and treats available exclusively at the Kroger family of stores. So what does cooking with healthy, natural ingredients for you and your family have to do with dog and cat food? Plenty, we learned! The folks behind the ABOUND brand believe that our dogs and cats should have access to the same kind of quality nutrition that the rest of our family members do. (And so do we, by the way!) So they set about developing a line that includes all-natural ingredients, high-quality proteins, wholesome whole grains and nutrient-rich fruits and veggies. Contains NO wheat, corn or soy fillers, NO animal by-product meal and NO artificial colors, flavors or preservatives. A commitment to rigorous quality control in sourcing and processing foods to help ensure food safety. We also love that ABOUND believes that every cat and dog deserves a loving, forever home. That’s why they are partnering with Best Friends Animal Society (BFAS) to help spread the word about BFAS's Save Them All mission, printed on all ABOUND pet food packages. For 30 years, Best Friends Animal Society has been focused on saving the lives of homeless dogs and cats. Rocco got the chance to sample ABOUND Chicken and Brown Rice dry food (it also comes in Salmon and Sweet Potato and Lamb and Brown Rice) as well as wet foods in the same flavors. Rocco says, "more yummy food please!" Rocco also eagerly sampled the ABOUND Grain Free Jerky Bites dog treats that come in three flavors: Duck and Potato; Salmon and Sweet Potato; and Turkey, Pea and Berry. You can easily tear the Jerky Bites Treats into tiny pieces, making them a great option for training. Rocco LOVES these treats! 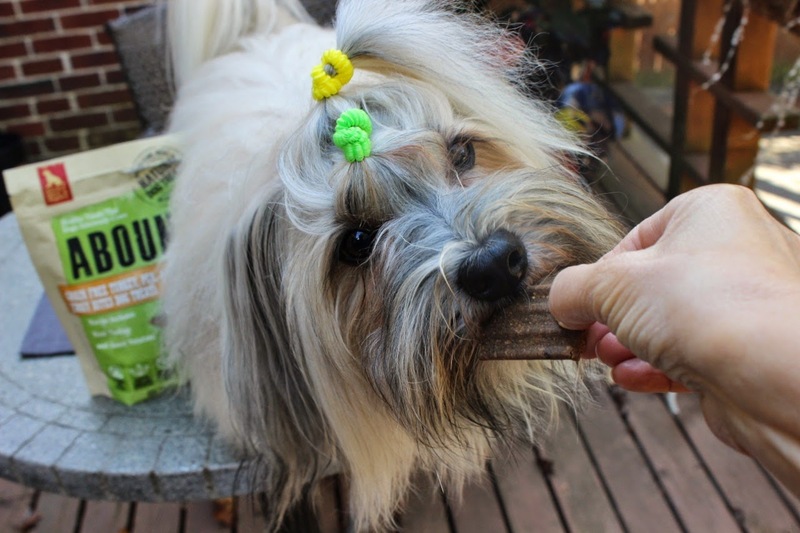 You can read more about ABOUND dog treats in this DogTipper review and about ABOUND cat food at CatTipper. 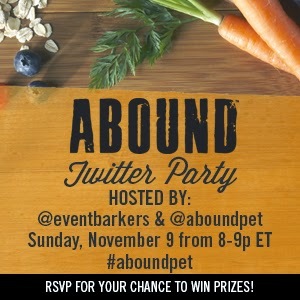 Join us at #AboundPet Twitter Party Sunday Night! 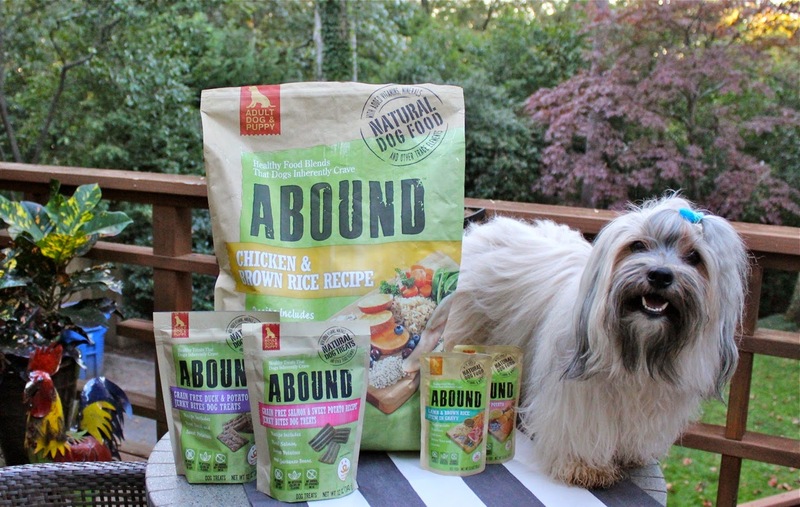 On Sunday night from 8-9pm ET, we’ll be co-hosting ABOUND’s #AboundPet Twitter party, a great way to learn more about the whole line of pet food and treats – and enter to win some of the over $750 in prizes! I have once again marked this on my calendar and hopefully, I can attend. 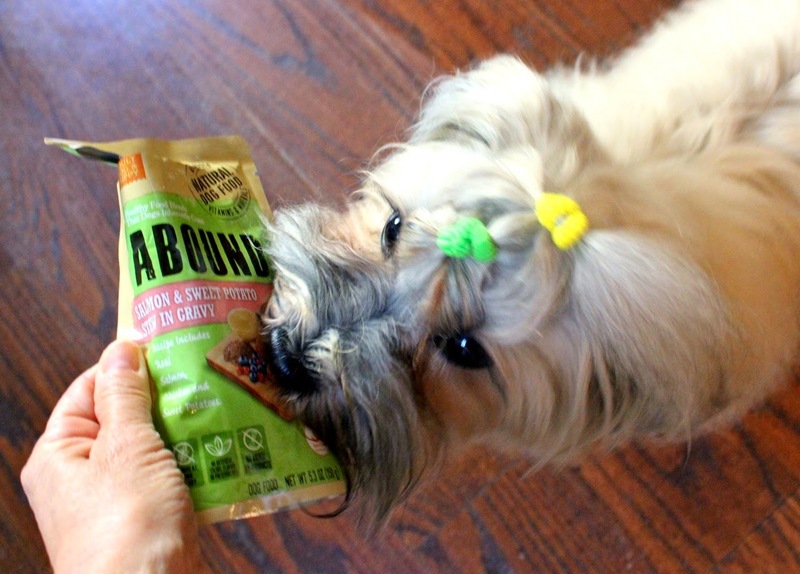 We LOVE the Abound dog food and gravy pouches. Bentley and Pierre lick their bowls clean. Thanks so much for the opportunity to try it for ourselves. Yummers! So glad Bentley and Pierre love it! Rocco loves the food and treats too! Hope to see you Sunday! Yay! It'll be great to see you there! "See" you Sunday! Have fun. Have a tremendous Thursday. Cat owners love cat food reviews because we all want the best canned cat food or dry food for our cats, and one decision we have to make is choosing the best cat food. We’ve seen a lot of cat food reviews for specific brands. But in this post, I will look at the big picture. So before you go on reading my cat food reviews, get to know the types of cat food first. There are 2 types of cat food: wet and dry. Different cat owners have different opinions about which type of cat food is best to feed their cat. My family has shifted to a new place recently. Since, I couldn’t find high fiber dog food in the new locality, so we are providing breads made of whole grain flour, which is rich in fibre along with seasonal fruits, and our pet is liking it very much. 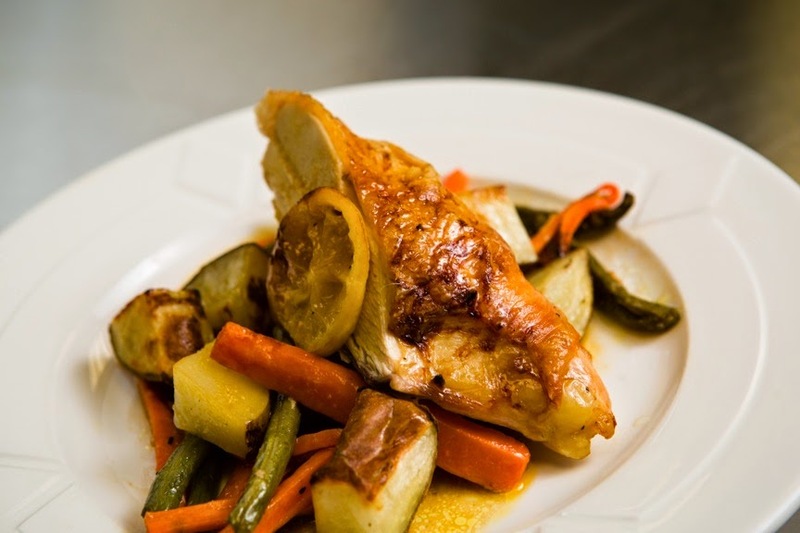 Proper healthy food is essential to fulfill nutritional requirement. We provide best dog food that contains all the nutrients in adequate quantity. I just bought Abound for my dog with food allergies last Thursday. He usually wants real meat in his food but he seems to like Abound as it is. That is so good to know because getting it from Kroger is more convenient than going to another store for grain free dog food.